Ok Sam, I found the perfect cartoon for me. 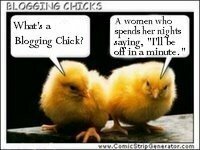 I always tell Sam ... one more minute, and twenty minutes later I'm still blogging. I've become a blog-aholic! (Thanks, Jen!) <--Smile! 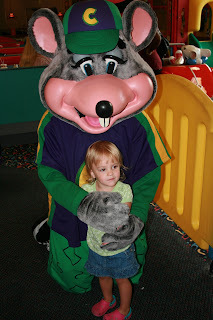 Ok one thing I left off my post for Chuck E. Cheese - and I wish I had a picture of this but I don't, so you'll just have to imagine it. I see Sam waving me over to this game - it's this game where the soccer balls come out of this cage at the bottom and the person kicks the balls trying to make a goal. Well as I approach ....there is a Chuck E. Cheese employee LETTING MY CHILD OUT OF THE GAME. Yep. 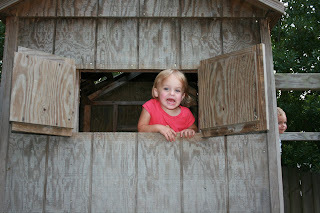 Avery crawled INTO the game, and couldn't get out, so they had to get someone to get a key to open the thing up. OMG. Only my kid, thankfully Sam was right there when it happened, because they pretty much just kind of go wherever they want in there! 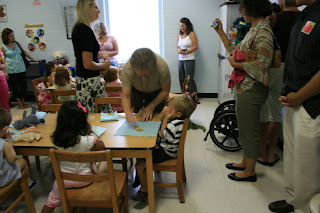 Zach had his first official introduction to preschool this week... they had a "teddy bear tea" where he got to bring his favorite stuffed friend (Dino) and he got to meet his new teacher (Mrs. Sharon) and meet all his new classmates! 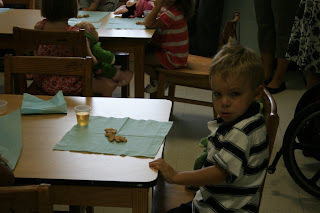 They also had a snack and "tea" (apple juice). Zach was REALLY excited to go all week long .... until we left. Then, the panic set in. He wanted to know if we were leaving him (no, we weren't THIS time) and he started to get a bit nervous. We walked into the school and he did fine, until we got to the classroom. Then the poor guy hit the floor. *Awwwww*!!!!! 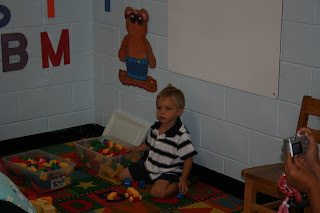 I am trying to keep in mind that this is the first time he's EVER been in this type of setting - we've always had a Nanny - even when I was working in the office every day, we still had a Nanny who lived with us, so the kids never have really been exposed to the "classroom" or daycare type of set up. I think it was also a bit overwhelming because the parents were there and the kids, and it was rather loud ... people were taking pictures and there was just a lot of overall commotion. So ....I'm hoping next week goes better. His teacher said it probably won't. She said the first couple weeks are GOING to be rough for him and that we should expect to drop him off kicking and screaming and crying. (Yeah, okay, that's gonna kill me.) She is confident that he'll adjust it will just take some time and the parents who linger or coddle the kids when they're dropping them off make it worse. So I'm going to DROP AND GO. Ok sure. LOL. The funny thing is - there are 8 girls and 4 boys in his class. ALL the girls did great - played with each other, talked, had fun - and ALL of the boys were just like Zach....crying, wanting to be held by Mom or Dad. I mean, Zach didn't even eat the snack or have the juice! You know the kid is freaked out when he passes on AJ! Zach did a little better by the end of the "tea" and he started playing with some Legos. 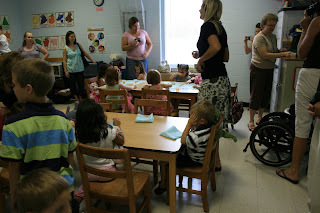 And when we left, he said "oh, I didn't say good-bye to my teacher". (Actually, we tried, but he had his face buried in my leg when we were telling him to say good-bye!) So we walked back in and said good-bye, or tried to, he was still a little shy, but it was encouraging! 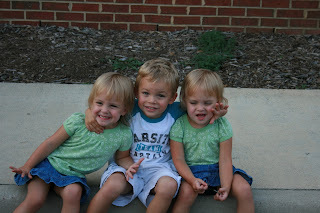 Here's some pictures.....and you can expect a few more on Tuesday - his first "official" day! I can't wait until he starts, I think he's actually going to love it. His name was on the board to be the "line leader" for the first week .... and it was on a big green balloon with his birthday ....and he has his own "hook" for his coat and backpack. (How cute is that??) He's so smart and loves to learn things, this is just going to be great for him.... if he can get past the first week or so! I'm just not gonna look. They forced me to sit here with Dino and I'm not gonna look at anyone. Well, it's not SO bad, these Legos have EYES! 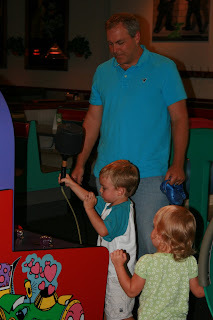 Today we took the kids to our most favorite place in the whole world... Chuck E. Cheese. There isn't much I can tell you about our evening except for a couple photos, and one or two videos I took when we got home. Ok I DID have to bribe them. They had to sit still on the CURB of Chuck E Cheese and take a picture together (and Zach had to put his arms around his sisters) and THEN we could go in. NOT that great, but closest I've gotten in awhile. At least Addie and Zach are smiling! Umm, Daddy..... these are KIDS games? 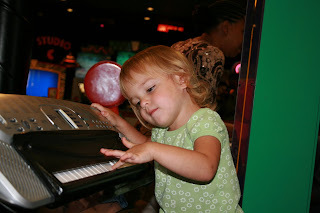 Here's Addie telling you where she was tonight...Chuck E. Cheemins. 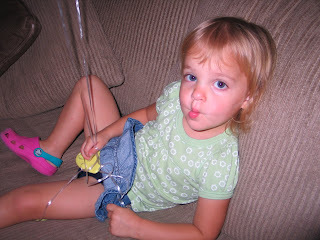 And here's her telling you how to say Elephant trunk. Crunk. My neighbor Jen and I planned an "end of summer - back to school" get together with all the people who live in our cul-de-sac. 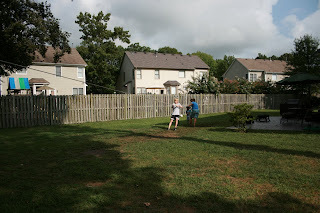 Everyone in the cul-de-sac came with their kids (more than 18 kids were there!) and it was a great time! 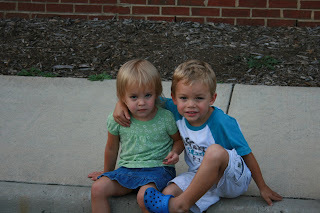 We had a bbq and lots of drinks - and an outdoor movie for the kids when it got dark! We had the movie in our yard ... and the parents stayed in Jen's yard! Jen.....I say we do that every Friday!! :) Smile!! The kids LOVED the outdoor movie - even my three who have the attention span of a - well let's just say a very short attention span - sat and watched the WHOLE thing! We had light sticks and popcorn......a great time was had by all! We brought the kids in after 10:00 and they were SO dirty from running around without their shoes on, rolling in the grass, etc. there was no possible way we could put them in bed without a bath. The were pretty wiped out by the time they hit the pillow (and so were we!!)! Anyway...here's some pictures from our fun evening...I have to say there is nothing better than living in a cul-de-sac, and certainly we couldn't be luckier to live in one where there are SO many kids and great friends! It's so nice to see them running around from yard to yard...and not having to worry about where they are. 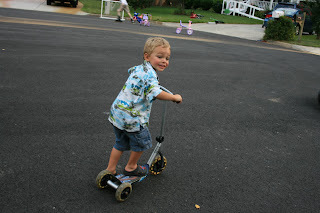 Um, Zach - did anyone tell you you're not old enough for a scooter thing yet? (And no helmet?) Jeez! 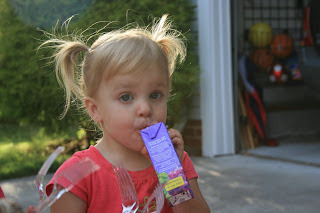 Doesn't she always have a juicebox in her hand??? 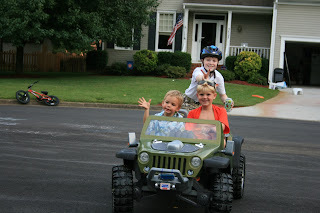 Here's some pictures of the kids getting ready for the movie....Sam brought home a projector and screen. It was great. Well, have a great night. I was going to blog Notre Dame, but having some computer troubles, it's moving a bit...slow. I'm going to have to work on that another night. Thought I'd do this first. Watch out next for Zach's Teddy Bear Tea (his introduction to pre-school) and our trip to Chuck E. Cheemins from this evening. Ok .... so if there was any doubt ... Zach definitely takes after his Daddy. The kids were all outside playing this morning and I see out my window Zach run inside the garage and come out with his bike helmet. He then runs over to our neighbors house - where two boys who are like 10 & 12 live - and I can see that Miss Debbie and the girls are there also. Curious on why Zach needed his helmet (since I saw what was going on over there the other day) I finish what I was doing and go over. 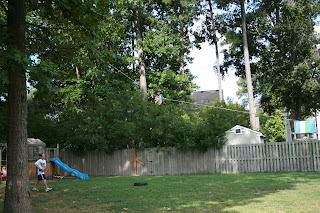 Let me back up for a second --- the other day we saw these two boys, and all of their friends --- had rigged up a zip line type of thing where they have this rope tied onto a tree branch and a swing seat tied to the rope ... and then someone sits on the swing seat ... and three or four other kids (with gloves!) 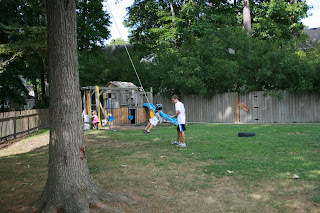 pull the other end of the rope so the kid in the seat gets lifted in the air 15-20 feet high. Sam was watching this the other night and he was laughing .... and he said oh, that's something I SO would have done when I was their age. 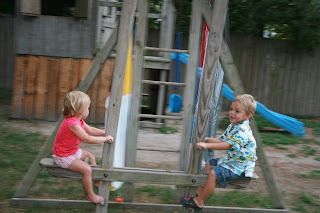 WELL......................................I go over and here is my SOON TO BE FOUR YEAR OLD having the TIME OF HIS LIFE. 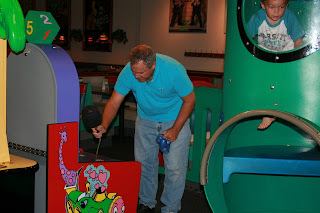 Yes, he thought this contraption was awesome - he had a blast, and he kept wanting to go, but he did wait to take his turn. 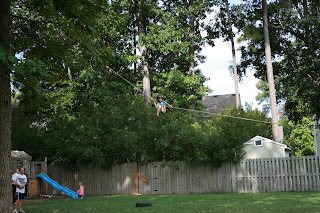 The kids were ALL so good with him and they helped him on and they didn't pull it too hard, but he wanted to go higher, and higher, and higher! Thank GOD someone had the sense to have him put on a helmet (Nanny Debbie, I'm sure!!) LOL!!! How high do you think he is there?? See that smile on his face???? Now he's helping the kids get the next person in line up...LOL! 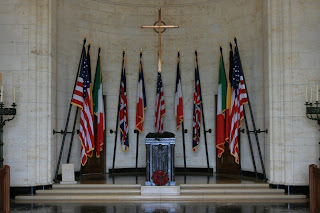 And so after the Argonne Forest and the American Cemetery, we continued on our journey to Paris. When we arrived in Paris (I think we both thought Thank Goodness for GPS) we looked for the Eiffel Tower as the "landmark". As many of you know, I grew up and worked in the Chicago area .... and the Sears Tower can be seen for miles away - long before you even get close to it. Well.....it's not the same for the Eiffel Tower, or at least not the way we came in - the highway from Germany (possibly it is from other directions.) We just figured it was going to be this gigantic thing we'd spot for miles and miles away ....but we didn't see it. We kept saying ... OK, so where is it?? LOL! 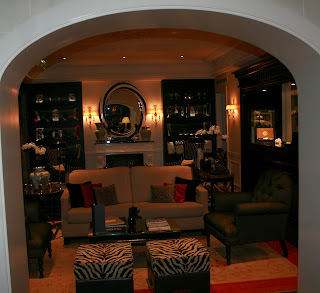 We get to our hotel, which was a wonderful boutique hotel right off the Champs Elysees. This hotel was designed by Pierre Yves Rochon, who also designed the Four Seasons in Paris and I'll just say that no detail was left untouched. It was probably the most modern hotel that I've ever been in - (from hallway lights that were motion activated to room dimmers and speakers throughout the room/bathroom.) The bathroom had one of those "waterfall" showers which we loved (had us contemplating re-doing our bathroom!) 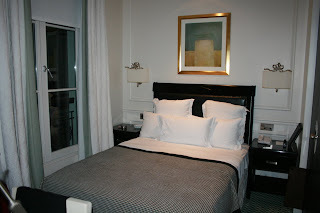 However, despite the modern conveniences the only downside was that in Paris, the room and the bathroom combined was about the size of our bedroom. Scratch that, it was about the size of Addison & Avery's bedroom! LOL!!! Seriously....we both couldn't stand next to each other if the closet was opened! Heehee! Anyway, enough of the hotel. It was pretty nice, you get that. We spent our three days doing all the normal touristy stuff - from the Champs Elysees - where I got a new bag at Louis Vouitton for my upcoming 30th birthday - (haha) - to Notre Dame to the Louvre to see the Mona Lisa and of course.....the Eiffel Tower. We loved walking around seeing the incredible architecture and eating at the outdoor restaurants and watching the crazy people trying to maneuver their way down the busy streets! We had some time to spare before our "behind the scenes" tour of the Eiffel Tower - which was a pretty neat private guided tour where you go inside the Tower's mechanical compartments and see how the lifts work, as well - we got to see an underground "tunnel" that was used way back in the war and now serves several purposes - it has storage for food for the Tower's gourmet restaurant, and it also has a passageway for the French President (much like what is supposed to be underground our White House) should there ever be a threat on the United States. We didn't get to go too far in, but we did get to go down the stairs and see inside ... it was under a lot of construction and it goes pretty far underground. We were there on the day that the Olympics started and our hotel wasn't too far from the Chinese Embassy. The first day we walked down the street where the Embassy was (first let me tell you this - Sam goes I think that's the Italian Embassy - I said are you sure? It looks more like something Middle-Eastern....we get closer and it was the Iraq Embassy. Heehee. Sorry hun. Had to share that one - you would share it if it were me! (And trust me, I'm half Polish - I honestly don't have a clue what the Polish flag even looks like. Probably two colors that don't match, right??) The flag WAS kind of scrunched together so you couldn't really tell, I'll give him that. I just had to share our funny moment, because we both went - uh nope, definitely NOT the Italian Embassy! Anyway, there is this building and it's HEAVILY guarded, like police in riot gear, machine guns (OK Sam... I know I'm slightly embellishing.... they weren't machine guns, but they were some sort of semi-automatic gun AK 47 looking thing, I have no idea the difference, lol) and they stopped us and were like "Are you going down that street" .... we were like "ummmm, no, that's OK" - we didn't know where we we were going anyway. So later on, coming the other direction, we saw the same thing. So I HAD to ask one of the Police Officers (he was sort of friendly...but not that much) what was going on and they said that it was because of the Olympics in Beijing. Can you believe that? What in the WORLD would the Olympics in Beijing have to do with the Embassy in Paris? What is the world coming to??? I just can't figure that one out. I also have to say, there were SO many police in Paris - I've never seen so many police in one big city - and I've been to Chicago, NY, LA and lots of other big cities. Later in our trip (after learning that) I asked one if it was common or if it was just because of the Olympics ad he said Paris always has a lot of police because of threats (terrorist, etc.) Scary! I didn't feel safer, I felt kind of creeped out! I mean every busy street corner had anywhere from 4-8 police officers (1-2 on each corner!) Crazy! This little outdoor restaurant that we ate at (twice) was right next door to Givenchy - which was basically right next door to the Chinese Embassy - and it was kind of scary - every time a truck stopped on the road I was expecting it to blow up! lol. Thankfully, they were just taking precautions! The Champs Elysees made me laugh - there were what someone from Sam's work referred to as "Ninja shoppers" everywhere - these Middle Eastern ladies wearing these scarves that covered their hair and most of their faces - but yet, they had MAKEUP on. Oh, and many of the "scarves" were LV, Gucci, Prada - etc. (UM, HELLO, I thought the WHOLE POINT of covering themselves was to not show beauty or worldly possessions or that type of thing???) She named them Ninja Shoppers because they were the rudest people of all - they walked right into you (expected YOU to move out of THEIR way) had loads of bags and kids trailing behind them, they apparently took something she was looking at RIGHT OUT OF HER HAND! Just definitely not what you'd expect from this supposedly quiet sort of people. I think a lot of people from Dubai come to Paris - maybe this is the case since Dubai is a very wealthy country, but what's up with the scarves? I don't get it - if you're wearing make up, buying all this stuff - WHY THE SCARF to hide it all? Someone help me understand that one, I'm sorry if I'm ignorant...but I don't get it. 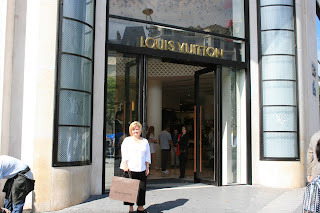 Here's me shopping on the Champs Elysees - you know - where Sam bought my THIRTIETH birthday present? GET THAT PEOPLE....THIRTY? 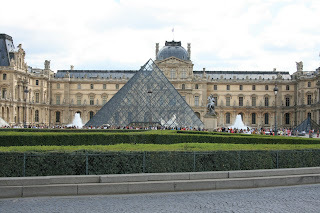 We spent about two hours in the Louvre - it was SOOOOOOOOOO crowded. I mean, panic attack over crowded. (At least I thought so anyway.) 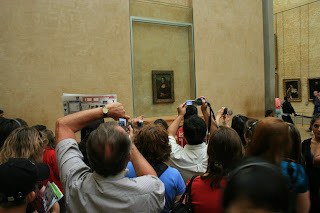 We saw the Mona Lisa, which amazingly is extremely small! Everything else in the room(s) where the Mona Lisa sits is huge ... but then there is this tiny painting. It's obviously the most coveted item there - there were tons of people taking pictures and standing in line to see it. It was an incredible feeling, though, to be standing just a few feet from it. I couldn't believe that they let you take pictures inside the Louvre. I thought flashes and such ruined the quality of the art, etc. 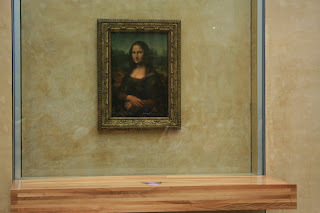 (Note, the only painting we saw that was protected (in about 5 inches of glass) was the Mona Lisa.) Everything else was right out in the open, you could pretty much walk up and touch it. (Well, I'm sure if you did you'd set off an alarm of some type but it was all within arms reach). Other than the Mona Lisa, we saw a few other notable pieces of art, but that was about it. You could spend probably full weeks there and not see everything - the museum is huge. Oh and the Louvre brings me to the story of getting ........... taken for a ride, I guess would be a good term. I walk up to him, first "artist" that I've seen (this is the first morning we've been in Paris.) He's got these wonderful charcoal pictures of the Eiffel Tower, some of the bridges, and some water colors ..... well if you've been to our house you know that most of the pictures on our walls are black & whites...I love black & white pictures. I saw this "charcoal sketch" of this bridge (that was around the corner from where we were) and it was so pretty. I asked him if he drew it, he said yes, see - it's charcoal - and he proceeds to rub a little off for me to show me that it's charcoal. He says the price is 20 Euros. I totally fell in love with the picture - not sure if you can see it but it's the bottom right one. I'm like what a bargain - 20 Euros for an original sketch! Woohoo. Maybe this guy will die and it will be famous one day! Sam is standing off to the side shaking his head but I call him over and tell him I need 20 Euros and he looks at the picture (he liked it as well) and the guy is trying to bargain with us at this point - 30 Euros and we can have any 2 that we wanted. I didn't want another so we just took the one for 20. I was quite happy and I told Sam he drew this picture and Sam was like mmhmm.... (what a skeptic, I am thinking to myself!!) And I was elated for about 12 feet. Seriously, 12 feet away was ANOTHER guy selling the EXACT same picture. EXACT SAME DRAWING, with the SAME SIGNATURE. FOR FIFTEEN EUROS LESS. Yeah, that's right - for FIVE EUROS. Ok that was my one and only SUCKER purchase. Of course, what made it worse, it's obviously a famous drawing. And we saw it EVERYWHERE. At every corner souvenir shop, every guy selling pictures or post cards - that picture seemed to stick out like a sore thumb - we seriously probably saw the sketch 10 more times. I kept saying - DON'T SAY IT. LOL. (OK you can have a laugh at me now.) Heehee. I DO like the picture, and I will forever remember that story so it will always have a meaning behind it. Even if it doesn't make me rich. 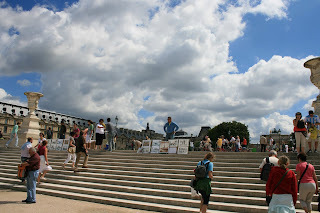 Here's some pictures we took at/inside the Lourve. 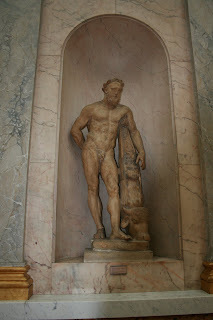 Hercules? Good thing he was strong. Well from the Louvre, we headed to Notre Dame ... and I'll work on that post next. Nortre Dame Cathedral was......stunning. We lit candles in prayer and it was just amazing being inside. I have to try to edit some of the photos because they all come out so dark (from the inside) - I hope my pictures will be able to describe in *some* detail just how beautiful all the stained glass and architecture is. Bonjour ... the last leg of our trip ... Paris! First .... let me say this. 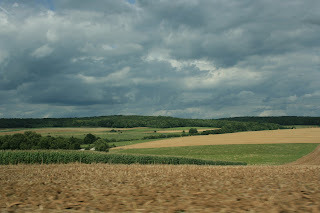 I went to France thinking I was going to hate it. I thought I was going to hate it because the people in Paris were going to be awful and rude and were going to do everything they could to show their dislike for Americans. Possibly it is because I (we) went with that attitude in our mind that we had such a COMPLETELY opposite experience. 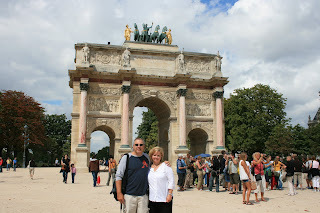 We had a fantastic time in Paris - almost all the French people we encountered (minus the tourists) were friendly, helpful, and very interested in our lives in America. 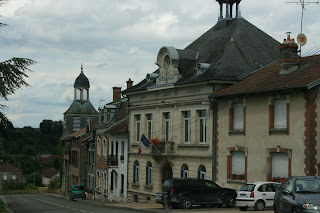 You can tell that the French are more "aloof" than other people, they definitely were not, for example, the overly welcoming, friendly people that we met in Germany who wave hello on the streets. However, it was nothing compared to what I was prepared for. That said, it (Paris) is not really a place I have a dream to go again - it was beautiful - the architecture was out of this world amazing - but I'm glad we went. 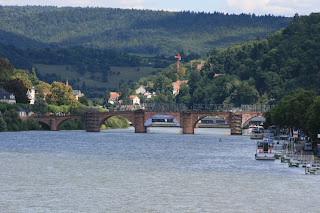 It was about a 4 1/2 hour drive from Heidelberg and everything you imagine about the French countryside .... is true. Rolling hills, farms ...vineyards ... it's all SOOOOOO pretty. 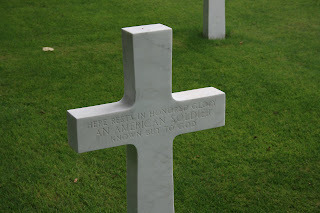 We saw a sign off the highway for Argonne Forest and the American Cemetery. This is a significant part of WWI. We decide to "take a road trip" since we had Neverlost and all ... and went in search of this memorial. We figured it would be a few miles off the highway ...lol, it was like 40 miles off the highway. That was okay, though....we drove through several small French towns and it was like a story-book ... old lady watering her overflowing flowerpots of her tiny rambling (but cute) little brick cottage on a cobble-stone street, kids playing ... bakeries and patisseries ... everything you imagine that French towns would be like. They were. I can't even really begin to describe it. We finally get to the Forest/cemetery and it's just ..... well, you get the goosebumps. 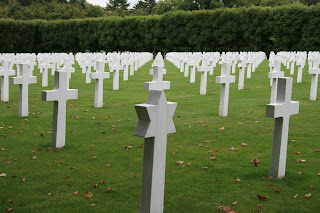 You see all the grave marker lined up (there were more than 14,000) and you start walking up to them and you notice that they are all within just a month or two of each other. There are over 900 "unnamed" graves at the cemetery and it was just ... moving, I guess you'd say. The cemetery ... click on the next photo to see what that grave with the flowers reads. 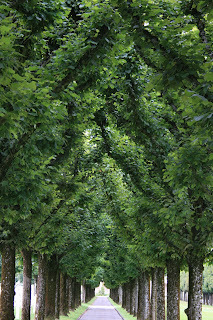 Picture of the tree lined walkway. Another little town...if you click the picture, it looks better. 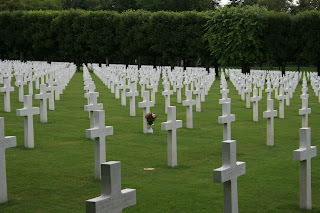 After the visit to the Cemetery, we got back on track and headed into Paris. 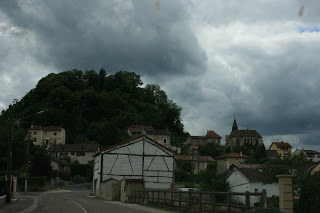 The little detour cost us a little time, but saved us a few Euros ... it's a pretty expensive tollway going up to Paris! 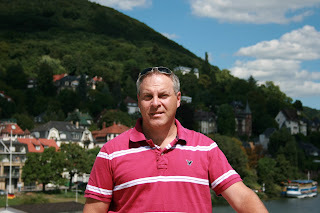 Day 4-7 of our European trip ...........Heidelberg! 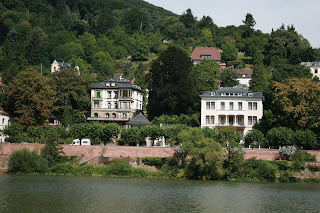 So with our luggage (firmly) in hand, we travelled to Heidelberg. I was laughing when Sam told me we were going to Germany and staying at the Marriott ... (I was like all the way to Germany to stay at a Marriott??) But like most Marriott's ... the service was outstanding and the hotel was beautiful. 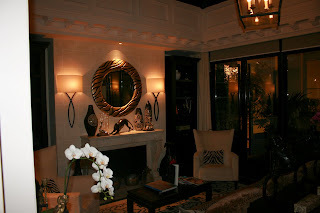 It was clean, (immaculately clean) and they were more than Americanized - the paper at the door each day was suited to your individual language (ours was English but I noticed next door to us was French, across the hall another language.) When we called lobby they spoke English right away so they must have had something system-wise that said we were Americans. Sam had his conference for two 1/2 days so after I slept in, and Sam brought me up breakfast - fruit and pastry or croissants ........... I hopped online to get some work done so I wouldn't be overwhelmed by e-mail afterwards. One afternoon, I got a great massage at our hotel - and surprisingly it wasn't expensive, only 60 Euro an hour (about 96.00 - pretty much what we'd pay here.) We had two functions (in the evening) to attend - the first was like a welcoming ceremony and the second was this awesome buffet style American BBQ - where they grilled up steaks, shrimp, chicken, corn on the cob, veggie skewers ...etc. Sam's company had a hospitality suite where they invited customers to come up and have drinks, snacks and play poker, etc. I was up there for awhile and it was pretty obviously that it was a "boys club" so I decided to go back to our room and get on the computer for awhile. (lol...though I will say he did bring me a cocktail or glass of wine every so often, so that was perfect!) In addition to having perfect cell phone service, we were fortunate to be able talk to the kids through Nanny Debbie's computer a couple times (and see them on her web cam) so I downloaded some photos onto our Kodak site so we could show them where we'd been so far! ...Speaking of Nanny Debbie - just to give her a few KUDOS - she's been doing a really great job over the past few months with our family. 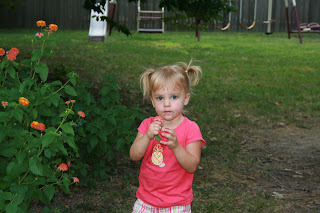 She's not only acclimated to us but she's gained a genuine LOVE for our kids that is more than we could have hoped for. She is seriously hoping to stay until the kids are in kindergarten and that is more important to us than anything (stability). She works on her "off time" and she gives her 110%. I am not sure if she reads our blogs all the way down, but I hope so because we think she's doing a GREAT job and I hope she knows how we feel about her. It is obvious that our kids love her to pieces and that - to us - is more important than anything. We want our kids to love the person who takes care of them during the days and it's clear that "Miss Debbie" is a constant and important part of their lives already. We were find her...she's definitely part of family already! 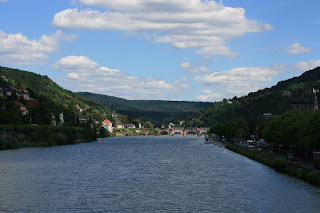 We walked around downtown Heidelberg and visited one of the Army bases that Sam ships to every week, and tour their warehouse which was pretty interesting. 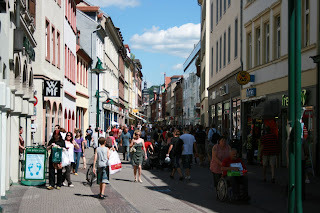 The little town was great - there were tons of restaurants and shops and we thought the people were extremely friendly. 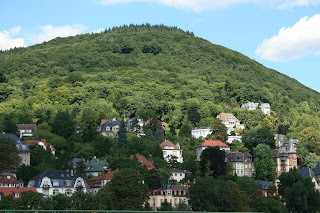 It's totally livable....malls, shopping, beautiful houses and scenery ... lol! 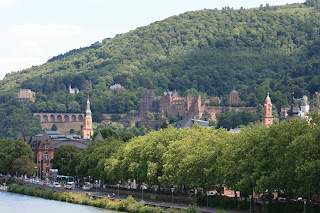 The Castle in Heidelberg...very beautiful. Unfortunately, we didn't take the tour. 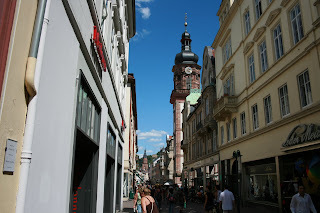 The downtown part of Heidelberg ... it was really great. There was even a modern mall ... we should have stopped here first after the airline lost our luggage! 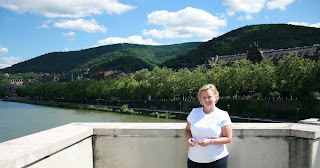 The houses along this river were so gorgeous.....and what a view!